Autumn is a gift, especially in the Catskills. This season of leaves is the time of the year to get out and enjoy a farewell to the warm weather. The heart of this scenic season extends from the middle of September to the middle of October. These are times when the first winter high pressure systems come billowing out of Canada. They bring clear, dry, but still warm air masses to the Catskills. With them comes a clarity of the atmosphere and a scenery unmatched the rest of the year. Within an hour’s drive or so from Woodstock there are a great number of wonderful fall landscapes well worth a visit. It is a terrible shame to let this time pass by without getting out. Take advantage of the autumn; winter is so long! There are some scenic views which stand out, literally above others. Some of the truly great Catskill views can be found at North Lake State Park. From the edge of the escarpment on the Catskill Front there is a 70 mile panorama of the Hudson Valley. Turn around and there is a view of the neighboring Catskill peaks. People have been drawn to North Lake since the early 19th century when the first road was cut up the mountain. During the late 19th and early 20th centuries this was the site of the famed Catskill Mountain House Hotel, once the premier resort hotel of America. Today the location is part of the Catskill Forest Preserve. After entering the park, drive to North Lake itself and hike north on the Blue Trail. It’s an easy walk for most people, young and old. You are following in the paths of thousands of hikers who have visited here over the past two centuries. Almost all these people have been greatly affected by the scenery here. The trail takes you along the very edge of the Catskill Escarpment. At some places it passes within a few feet of a sheer cliff. Along the way you will pass Artist’s Rock and eventually you will reach the Yellow Trail turnoff. Follow this to its end and there you will reach a ledge named “Sunset Rock” after a great boulder there. Before you is one the single grandest views in all of the Catskill Mountains. To the east is that 70 mile view of the Hudson Valley with the Taconic Mountains beyond. To the south is the view of North and South Lakes, and to their east is South Mountain. 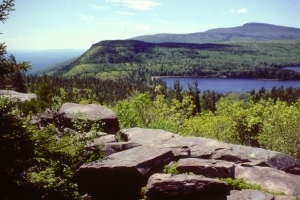 Beyond them you can just make out the upper reaches of Kaaterskill Clove and still farther away are Roundtop Mountain and High Peak. It’s an impressive sight to say the least, and it’s one which has played a role in the development of American art. Virtually all of the great 19th century landscape artists, beginning with Thomas Cole, came here. They set up their easels or sketched here and turned out canvases portraying the site at different times of the year and different times of the day. Watch for work by Cole, Sanford Robinson Gifford, Jasper Cropsey, William Henry Bartlett and others. Most of their many works are easily found online. But I am a geologist and, while I greatly admire those artists and their work, I see other things from this site. I sit on Sunset Rock and look north, and soon I can see it as it was 23,000 years ago. As I watch, the years and decades pass by rapidly. The climate slowly turns cold and soon it is becoming Arctic. As the decades and centuries elapse the forests turn sickly gray and then die. The skies are usually blue and sunny, but cold dry gale winds blow out of the northeast. They shatter the brittle old tree limbs. To the north a low whiteness appears in the Hudson Valley. It is dark blue in the morning, radiantly white at noon and aquamarine just before dark. As the years continue this white advances south and its image focuses into that of an advancing glacier. It passes beneath the Sunset Rock ledge and continues down the Hudson. Slowly the swell of ice thickens. Like a stream in flood, the ice slowly rises and fills the valley. It laps up onto the Catskill Front and soon a stream of white overflows the valley and advances southwestward across what someday will be North and South Lakes. The moving ice is very erosive and it’s beginning to scour out these basins. Now even more ice pours down the Hudson. All along the Catskill Front ice is overflowing the valley and still it continues to thicken. Next comes the great swell of the main glacier, an ice sheet at least 3,000 feet thick. The white soon overwhelms all of this region. It continues to advance southwestward until all of the Catskills are entombed. The whole region becomes a great white, high Arctic plain. That’s a somber vision to have on a beautiful autumn afternoon, but that is what I see from Sunset Rock. Contact the author at randjtitus@prodigy.net. Read Robert and Johanna Titus in the Woodstock Times, Kaatskill Life magazine, Upstate Life magazine and the Mountain Eagle.